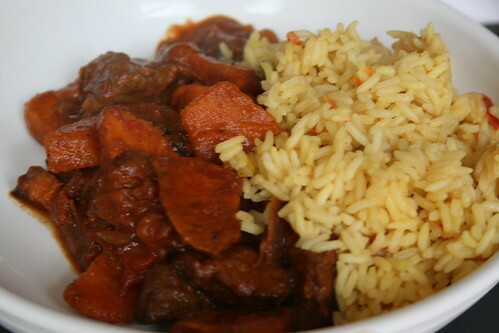 Originally, I made this as a beef and butternut squash curry. 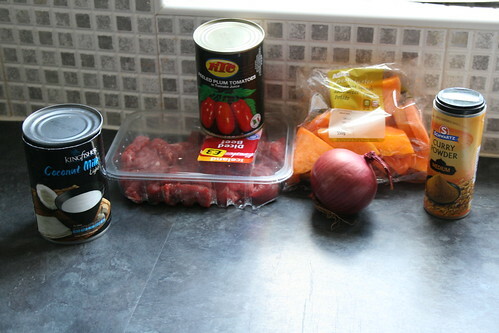 However I have real problems cooking stewing beef. As in, I’ve never been able to cook it without it being chewy or completely incinerating it. This time it was chewy. Ridiculously chewy. So I’m just leaving it out. But that’s why there are photos of beef throughout this recipe. 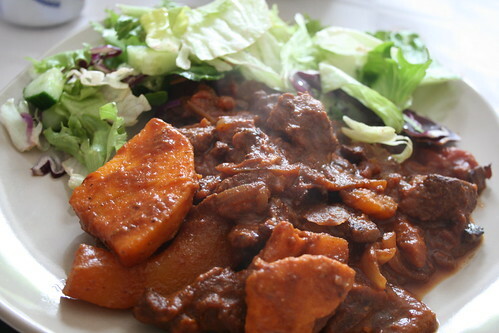 So, butternut squash curry. I love butternut squash. My butternut squash soup is one of my favourite lunchtime meals, and I will happily roast or mash it in place of potatoes. Squash is gorgeous. This curry is really, really good. Creamy, warming, filling and incredibly tasty. And fast — it’s ready in under 25 minutes. The kind of thing you can fall in from work and make to eat in front of the TV when your brain just does not want to work. I like those kinds of recipes. Spray a large, deep, non-stick frying pan with Fry Light and put it to warm over a medium heat. Peel, halve and thinly slice the onion, before frying it in this pan for 3 minutes. 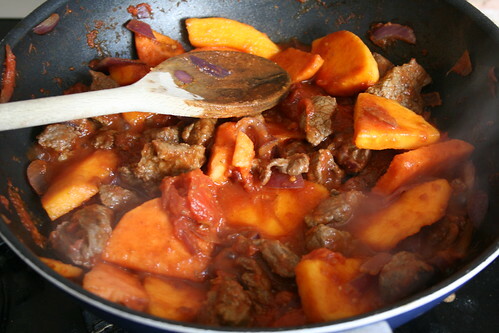 Then add the squash, the can of tomatoes and the curry powder. Pour in the coconut milk and stir it through well. 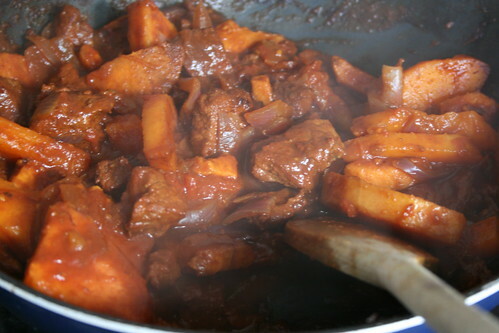 Then reduce the heat to low, cover with a lid and simmer for 10-12 minutes. Or, if you’re feeling extra virtuous, a big portion of mixed salad goes very nicely. I can’t see any syn’s on this? There must be syn’s with the coconut milk? Brilliant, thanks for this recipe. I look forward to trying it.